Chrome for iOS users have an update waiting for them, and if you’ve been trying to use Chrome on a new iPhone, you’ll want this new version: Google optimized the browser for Apple’s larger screened iPhone 6 and iPhone 6 Plus. I tend to use Chrome on all of my devices but since buying an iPhone 6 from [company]Apple[/company], I’ve had to move back to Safari. Why? Because both content and browser controls didn’t properly scale to the new screen sizes of Apple’s handsets. Instead, I felt like I was giving myself a daily eye exam as text and buttons were just too large. Now, after installing the update, all is right with the world and my eyes are happy: Everything scales properly and still looks crisp. [company]Google[/company] also expanded Drive support in Chrome for iOS. 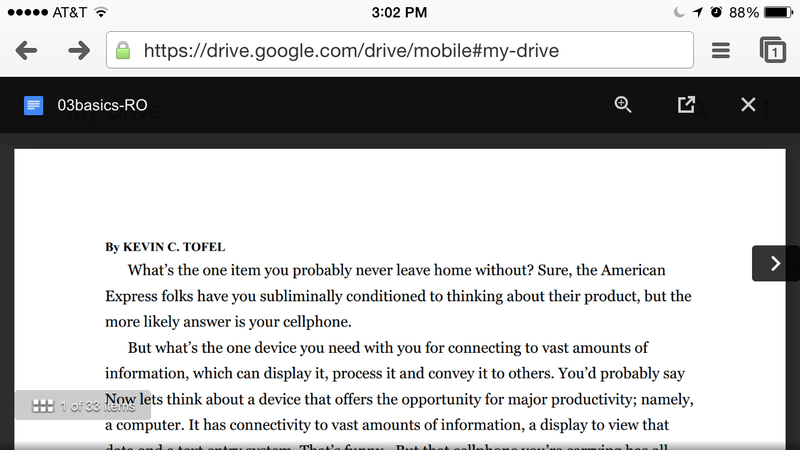 You can download or view Google Drive files directly in Chrome, mimicking some of the features of the Drive for iOS app. Previewing a file on the iPhone works just like it does on Chrome for desktops: The document appears in front of the browser window, where you can scroll around and view text or images. Tap the X button at the top right of the document and the window fades away. The Drive support is really just a bonus for me; the Drive app works just fine as needed. Adding proper scaling support for the new iPhones is the bigger deal and will get me back to using Chrome on iOS again.